Looking forward to it. Third in line behind Dance With Dragons and Ghost Story. Congratulations on your new arrival. Looking forward to it. If I were you, rich, I’d skip Dance with Dragons. compared to his previous books it was terrible. I’d be surprised if it shows up early. Let me know if it does! The usual situation is for the books to arrive in storage and not make it out onto the bookstore floor for a little while. True. The speed in which a book hits the shelves depends on how quickly a particular bookstore can get it from the back room to the shelves and that can vary due to lots of factors, from people calling in sick to favoring working out hardbacks/trade paperbacks over mass market paperbacks. Well, I forgot to check on bn.com yesterday, the 29th, so I pretty much blew that aspect of my experiment. 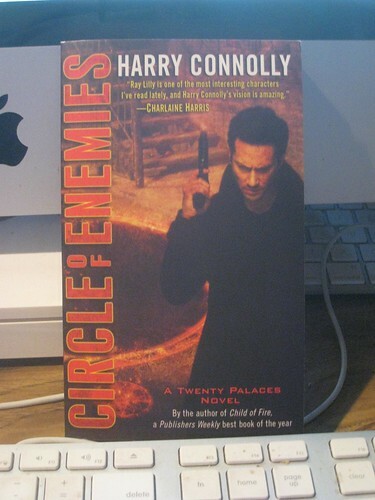 As of today, August 30, the release day, Circle of Enemies is not showing as received at my local B&N, but it is available for $7.99 on BN.com and on my Nook, so I have no choice but to extract my foot from my mouth and admit that “e” has won out over “dead tree” with regard to allowing me to get my mitts on the book as soon as possible. Since I have almost no ability to delay gratification, I’m buying the ebook as soon as I post this comment so I can start reading it tonight and finish it on my day off tomorrow. I’ll buy the MM edition–when it finally gets into the store–to keep my physical collection intact, too, and hopefully help Del Rey come to a positive decision with regard to future publishing of your books. I’m sorry you had to buy it twice, and I don’t like that B&N doesn’t have it in. That’s a bad sign for potential buyers who wouldn’t be willing to pick up a digital copy.